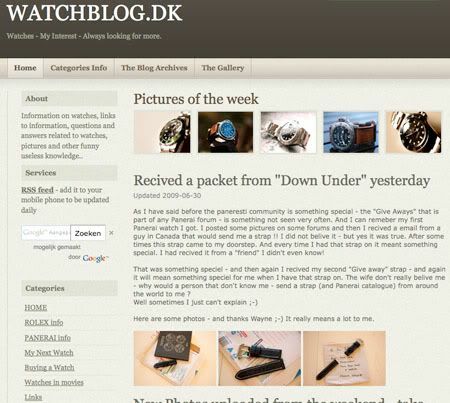 Since a few weeks, I am following my friend Jan from Denmark with his watch blog. He blogs mainly about Rolex and Panerai, including new & vintage models. He also seem to have – like myself – a weak spot for the Danish Linde Werdelin watches. The 3-Timer I ordered won’t be here before September, so I am grabbing every chance I got to read about Linde Werdelin 🙂 Jan’s WatchBlog.dk website is, like FratelloWatches, a personal blog about watches. His opinion, his knowledge, his thoughts and rants.. Great! Especially when a blogger knows his stuff, and Jan certainly does. Click here to visit WatchBlog.DK!